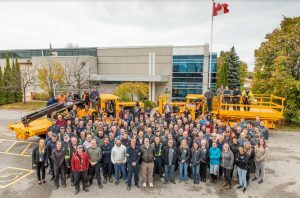 The MacLean team is sending its 100th boom truck and its 200th scissor lift to Canadian mines in Quebec and British Columbia. COLLINGWOOD, Ont. – Two production milestone units are ready to roll off the line at MacLean Engineering’s manufacturing facility: SL3 scissor lift No.200 and BT3 boom truck No.100, going to mines in Quebec and British Columbia, respectively. Eldorado Gold purchased the 200th MacLean scissor lift for Lamaque mine in Val d’Or, Que. This makes for a total of 15 MacLean machines on site, with five more on their way for 2019. “Eldorado is an excellent corporate citizen in Val d’Or and a valued customer for MacLean. We’re honoured to work with them at Lamaque – the MacLean fleet will be well supported by our local branch for many years to come,” says Tony Caron, MacLean GM for Quebec and Latin America. Centerra Gold’s Kemess Underground project in British Columbia’s northern interior is the destination for MacLean’s 100th boom truck. Kemess is a former open pit gold and copper mine that is currently in the feasibility study stage for a block cave mining operation. Already on site is a MacLean Anfo charger, in preparation for underground mining to commence. See MacLean’s full line of battery powered mining equipment at www.MacLeanEngineering.com.